Smart readers know better than to judge a book by its cover (or maybe not), but what about judging a book by its title? A book’s title is there not just to identify the book, but also to make a statement about what’s inside its pages. Readers will gain their first impression of your book from either its cover or its title, and that makes your title one of your most important bits of marketing. No pressure, right? Some authors wait until after finishing the first draft to title the book. Some, like me, need at least a working title before the idea can even begin to gel. Traditionally published authors may not have much say in their book’s final title. Independent authors sometimes have too much say. Whatever camp you fall into, your title shouldn’t be chosen lightly. Today, let’s consider some of the factors that should inform that decision. 4. Curiosity Inducing: Do Androids Dream of Electric Sheep? Although titles aren’t copyrighted, you always want to think twice about choosing a title already in use. If nothing else, your title will have to compete for search engine rankings and could confuse readers. 2. How many words is it? The number of words in a title often depends on the genre. Thrillers and suspense novels often have titles of a single word. Literary and humorous novels might have titles that consist of half a dozen or more words. Shorter titles are often more memorable and more convenient for cover design; longer titles are often more unique and descriptive. 3. Is it specific instead of vague? Which book are you more likely to pick up—Lunar Colony or The Moon Is a Harsh Mistress? Loving a Scoundrel or Gone With the Wind? Trouble in a Small Town or What’s Eating Gilbert Grape? 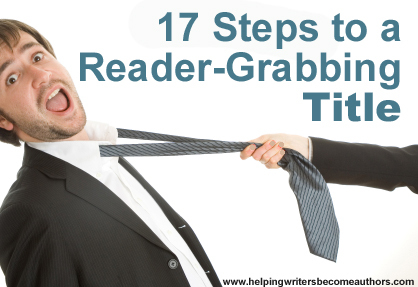 Readers probably aren’t going to snap up your book the first time they see or hear your title. But if that title is an earworm that sticks in the backs of their brains, they’re much more likely to pay attention the next time they run across your book. 5. Is it consistent with your brand? Remember: titles are marketing. Particularly if you’re writing a series, but even if you’re not, you ideally want to choose a title that fits in with your previous books and overall brand. Consider Janet Evanovich’s use of a number in every title in her Stephanie Plum series or Sue Grafton’s use of letters in the titles of her Alphabet Mysteries. 6. Does it spawn any good cover image ideas? Your cover image (which may be totally out of your control anyway) may end up having no obvious connection to your title. Indeed, sometimes that very contrast is a good hook. But as you’re brainstorming titles, consider how each one would look on the book cover. What images would you envision seeing beneath or behind each title? Now that you have an idea of a good title’s components, what steps can you take to come up with your own perfect title? 1. Research titles in your genre. Zoom by Amazon and take a look at your genre’s bestseller list. What do the top twenty titles have in common? Write down the ones that particularly pop out at you and note the elements that make them attractive. How can you replicate their effect? 2. Consider your book’s text. Your title makes a promise to readers about what they will find inside the book. So why not look inside the book itself to find the title? Are there any lines that pop off the page? Any particularly memorable or unique phrases? What one line in the book best sums up the theme, premise, or protagonist? 3. Look up words in the dictionary. Grab your dictionary and flip it open to a random page. Do any words pop out? Make a list. One of my favorite techniques is to pull vivid imagery from songs, poems, and old books (the King James translation of the Bible is particularly full of strong and unique words). Make a list of the best phrases and start playing with them. A little clever wordplay can go a long way toward making your title stand out. Scribble down every title, word, or combination of words you can think of. I often cover pages in my notebook with various title ideas. Most are dumb, but there’s always one that finally pops out as the perfect representation of the book.Titles can be both fun and difficult. Don’t feel pressured by their importance, especially early in the process (you can always change titles later on). But don’t discount their importance either. Tell me your opinion: What is your process for brainstorming a title? http://kmweiland.com/wp-content/podcast/title.mp3Click the “Play” button to Listen to Audio Version (or subscribe to the Helping Writers Become Authors podcast in iTunes). Thanks SO much for your opinion, it was really helpful. I got with “That little something I didn´t tell you” too. I like the eagles one, so I´m ubber happy you like it too (specially the preposition. It being unique is really a compliment). I prefer short titles for my own books; ‘Back Dated and ‘Soul Trader’, but one of my favourite titles by another author is ‘A visit from the goon squad’ which I bought on the strength of the title alone. @Chris: Generally, I prefer short titles as well. But some of my favorite titles of other authors’ books are long – either lyrical or humorous. I’ve noticed many titles pick something minute out of the story and make that the title. Term Limits has nothing to do with any political shortening of term, but since some Politicians were killed off, I guess their terms were limited. Great book. Deception Point-The world was being deceived so. DP. Wizard of Oz is about one character at the end of the story so to speak. More catchy that the Adventures of Dorothy, but then we has The Adventures of Alice in Wonderland. What gives there? My new novel is a thriller. The fact the main character seems to never have been able to make choices in his life and his absent Father made them for him; I have titled my book, Checkmate. People need to make choices and there are always concequences… Thus my book. Titles tend to be very trendy. What works in one era isn’t necessarily what’s popular in the next. Hence, all the character names in the classic era (Emma, Adam Bede, Nicholas Nickleby), which we hardly ever see anymore. This really helped! Thanks so much!!! Sorry, long post…but please read! I am currently working on the first book in a series of two. I am struggling with title formation, as I have a title for the whole series in mind that would give each book it’s title, but I hear that it is too similar to other works in a similar vein. It is a book about a psychic vampire (energy-sucker rather than blood) and a girl that he meets and half-turns and then he sets out to kill her because she is becoming too powerful, but she ends up becoming best friends with a vampire hunter and they plot to kill him. They succeed in their plot but the girl is still half-turned, so she has to deal with the repercussions of that. At the end of the first book, she realizes that she has a supernatural power to change her own history through a therapy that she receives at a mental institution. The first book ends with her questioning if she should change it so that she never meets the vampire and gets half-turned, or if she should continue to try to find a way to change back that doesn’t involve rewriting history. The second book is the story of her rewritten history and how her life is different after that. My working title for the series is Darkness Before Dawn. I planned to call the first book Darkness and the second book Dawn (they may end up being just two parts in one book, thus the book title would be Darkness Before Dawn. Friends have told me that it is too similar to Twilight and Breaking Dawn. What are your thoughts? If you don’t like my current options, do you have any suggestions? I like the idea! My concern, from a marketing perspective, however, would be that all three titles are pretty generic and will have a hard time ranking well in either Amazon’s or Google’s search engines. I thought of a new one as I was driving through town just after posting my last comment. I love it so much more! I am thinking that I will call the first book Soul Thirsty and the second book Satisfied. What do you think? Oh titles… I always have such a hard time XD Mostly because I get too caught up in them and tend to second guess myself. I also have a habit of writing series. So I can come up with the series name, but have issues on the individual book titles. That’s actually true for my current WIP. It’s the first in a trilogy. Right now, the working title is: “Blood Runs True”- Book 1. It’s that first book title that keeps eluding me!